This is an early localization prototype of Illusion of Gaia. Sometimes searching through the archive of scene releases can bring up some very special things. 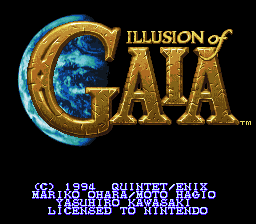 Illusion of Gaia, the sequel to Soul Blazer, was published by Nintendo, probably after the collapse of Enix' US division. It is not a hard sell, this game is beautiful, with one of the best stories ever in an RPG. 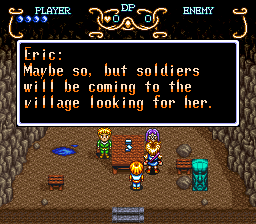 The prototype version that was leaked shows that Enix intended to publish the game themselves, and had actually completed the localization before passing it off. 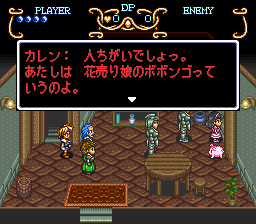 The localization is arguably more faithful to the Japanese script, which I will document below. This particular prototype was leaked by the scene group Numbers, and was apparently one of the first releases by this particular group. I found no obvious hacks in this game, it is possible this is a clean dump. detailed story-line, more uses of Mode7, and great graphics. The scene release was on May 19, 1994. According to Nintendo's website the game was released on September 1, 1994, which is actually not that long after the scene release (the scene release of the Nintendo version came out on September 29, 1994, and mentions it is different). They may have just did some quick changes to the script and left it at that. 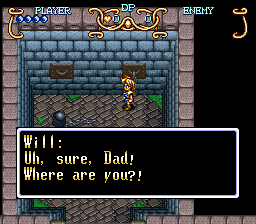 I have only played through to the prison in Edward's castle, but overall the text still remains faithful to the Japanese version, even with the changes in the Nintendo version. The Enix localization is more direct, though, and may be preferable to some people who like accuracy. 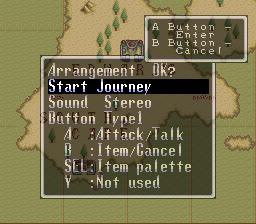 The Enix localization has some grammar and punctuation errors that shows that it was not finished. 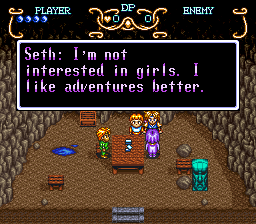 Oddly, Nintendo's changes make the characters seem more uncaring. 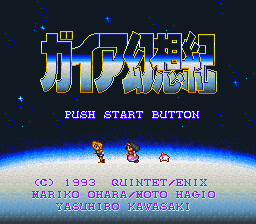 The prototype title screen is pretty similar to the Japanese version. 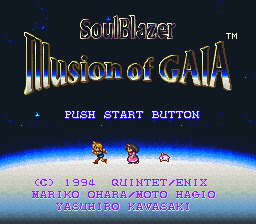 They also made it clear that this is part of the Soul Blazer franchise. 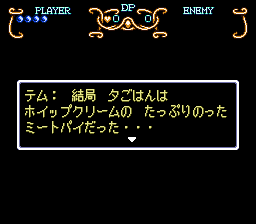 Also, the copyright year has been changed in the prototype relative to the Japanese version. For some reason, Nintendo switched the menu options button from X to Select. 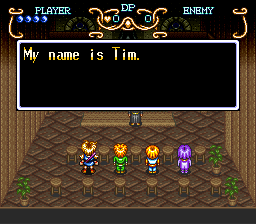 Nintendo changed the name of the main character from "Tim" to "Will". 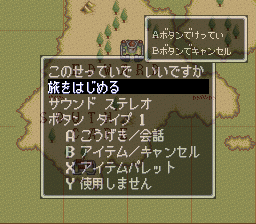 All of the names in the Enix localization are the same as in the Japanese version. 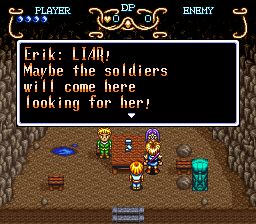 Nintendo changed Erik (Eric in the prototype) to be more accusational. 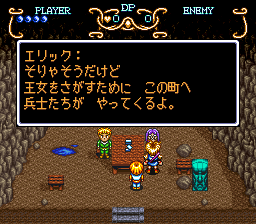 The tone in the Enix localization is maybe more similar to the Japanese version. 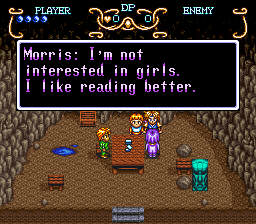 Seth (Morris in the prototype and the Japanese version) is more nerdy in the prototype, and prefers books to adventures. in the Japanese version, he likes his books. 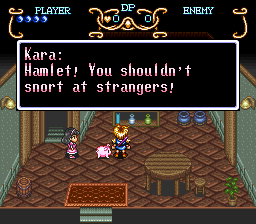 In the prototype, the princess is named Karen rather than Kara, while Hamlet is named the less porky Becky. Both are the same as in the Japanese version. Again, the Enix localization is closer to the Japanese version (いじめ means "bullying"). 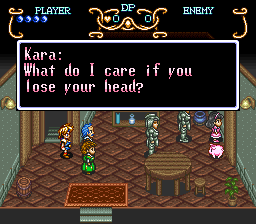 When the soldiers come and take the princess back home, Kara, in the final version, doesn't seem very concerned about the welfare of the soldiers. 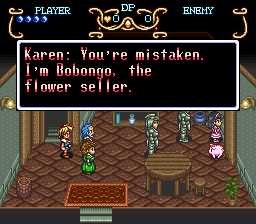 The Enix localization follows the Japanese text, and she tries to claim she is "Bobongo the flower seller". For some reason, Nintendo changed "meat pie" to "snail pie". I suppose that they wanted to really make the point that Grandma's cooking was not good, but isn't putting whipped cream on a meat pie bad enough? The Japanese version is a "meat pie with whipped cream". 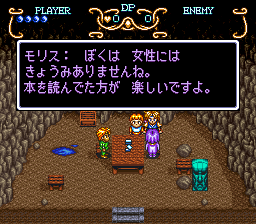 Nintendo also changed "dinner" to "feast", probably because dinner is not the universal word for the main meal at night. Nintendo changed the "assassin" to "famous hunter". Maybe assassin was too intense? 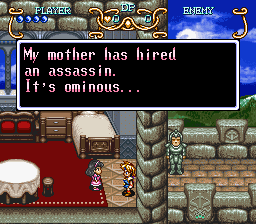 The Japanese version calls him 殺し屋, which essentially means assassin. 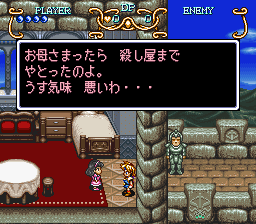 Another note, in this scene, the background was changed between the Japanese version and the localization. 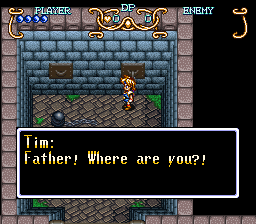 In the prototype, Tim exclaims "Father" when he begins talking to him via the flute. Will, in the final version, seems less impressed.